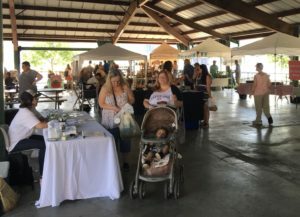 The Poughkeepsie Waterfront Market is a vibrant summer Market that operates from June through Labor Day on Monday afternoons on the shore of the beautiful Hudson River. We invite you to discover this seasonal Market and celebrate the agricultural bounty of the Hudson Valley! Market Location: The Pavilion at MHCM (75 N. Water St., Poughkeepsie, NY). Free onsite parking. The Poughkeepsie Waterfront Market is open to the public and features farm fresh vegetables, fruits, meat, eggs, poultry, baked goods, maple products and more. The Market, now in its third year has expanded its selection of agricultural products available from local Hudson Valley farms. 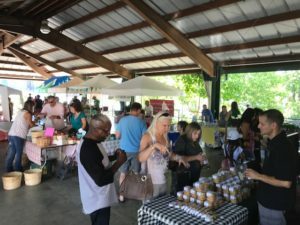 The Market’s 2019 season will also feature prepared food vendors and local artisans offering hand-crafted kitchenware items, as well as live music and a rotating showcase of local non-profit organizations. 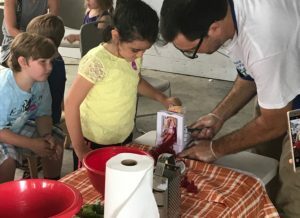 The Mid-Hudson Children’s Museum opened the Poughkeepsie Waterfront Market in summer 2017 to connect City residents and families with fresh, affordable and locally-produced food. 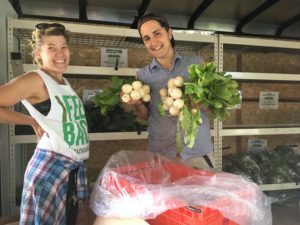 In doing so, it became the first children’s museum in the country to open and operate a public farmers market as a strategy for fighting urban food insecurity and advancing community health. The Market is now a certified SNAP Market and also participates in the WIC Farmers Market Nutrition Programs to ensure the affordability of fresh produce and farm products for low-income individuals and families. A new grant received from MVP Healthcare in 2018, allowed the Market to implement a new Electronic Transfer (EBT) system, enabling customers to use SNAP benefits from a government issued debit card. The Mid-Hudson Children’s museum is centrally involved in the revitalization efforts taking place along the Poughkeepsie Waterfront. The operation of this Market provides MHCM with yet another way to support the City of Poughkeepsie and the region by making fresh food available to City residents and visitors all while showcasing the agricultural bounty of local Hudson Valley farms. The Poughkeepsie Waterfront Market is steps away from both the Poughkeepsie Train Station and two city parks, making the Market accessible to City residents, families visiting the Mid-Hudson Children’s Museum, tourists and commuters alike. The Pavilion that hosts the Market is fully covered, offers public restrooms and free onsite parking at the Mid-Hudson Children’s Museum during the Market hours.